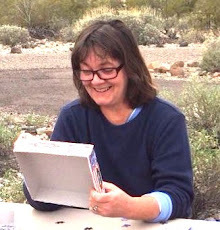 The Good Luck Duck: What do ruins, Clarkdale Arizona, and cupcakes have in common? Wednesday! What do ruins, Clarkdale Arizona, and cupcakes have in common? Wednesday! It was five years ago this week that I first visited Tuzigoot National Monument, and five years later that I second visited. It reminded me of how much I loved the Southwest immediately, and how being here still feels just right, Goldie. My friend, Jac, told me that Clarkdale is cute. She can't be trusted, so I went to see for myself. What I noticed first, last, and in-between was how quiet it is. Not eerie quiet, just still. I saw and greeted people walking here and there, but they weren't loud folk. Some of y'all know I'm not a museum kind of gal. But, just the same, when faced with Arizona's Greatest Treasure, the Copper Art Museum, even this non-cerebral waterfowl has to test her mettle. Not everyone is going to be interested in the same thing, but if you're into copper at all, I think you'll like this place. There is a LOT of copper. I learned that copper is an antimicrobial element. A manager told me he hopes to convince local grocery stores to let him install a copper coating on the cart handles; that's an experiment I'd be fascinated by. I'm not being facetious - it's right up my alley. People used to store water in copper for its antibacterial qualities, apparently. Brass doorknobs are naturally toxic to most bacteria. Microbiology: TELL ME ALL THE THINGS! Adults $10 (inc. tax), seniors $9. Other people, who remembers? The building was the high school until 1960. Evocative! The rooms are sunny and big, and it was easy to slip into a time warp (it's just a jump to the left ... ). And so, when I left the building, my head was still mid-century. I walked up Main Street, where a mechanic was, I swear to you, working on a '56 Chevy pick-up in front of Clarkdale Classic Gas Station (where they pump your gas for you). I strolled past the 10-12 Lounge, where you can refresh yourself from 10 AM to 12 AM. There are some establishments that look like they're ready to spring to life in the sinister innocence of 1960. Emphasis on innocence. There is an old railroad car positioned strategically on a corner waiting to serve you coffee and yummies (I bet - they're not open now). 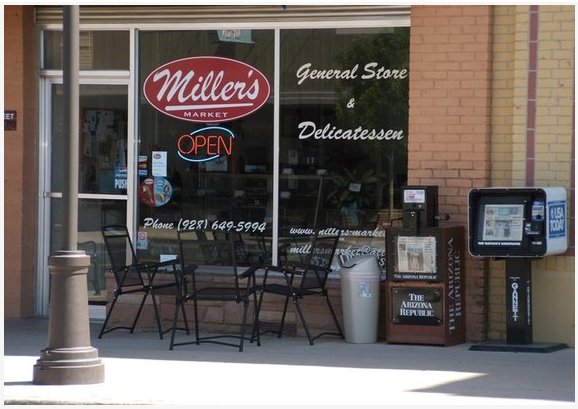 Miller's Market is undergoing renovation and will re-open in the Spring of 1961. Thanks for the pic, Laura J. It would have been ridiculous to come right through Old Town Cottonwood without stopping for an hour at the Wild Rose of Historic Old Town Tea House. I sat on the patio and life lived me for a while. There was nothing much-needed at Ye Olde Hippie Emporium, but I had to check to be sure. I just left here a few days ago with more books than a vandweller ought to have. I had no idea Clarkdale had so much to offer! I would love the Copper Museum and, of course, the cupcakes. Screw the museum. A small town with a bar and cupcakes? Now you're talking. I've been there! Not too distant, if I recall correctly, from There's No HOPI. This post "reminded me of how much I loved the Southwest immediately" and causes me to wish I'd given it more serious consideration when I relocated from Charleston (especially since this long, miserable, insufferably cold winter seems to refuse to loose its grip). Is that turquoise rock in the 1st photo? Wow! As always, your photos and your wit are a delight! Whereabouts are you now, Karen? I've heard good things about Charleston - was it hard to leave? I think it's some copper-bearing rock, but not turquoise. Bleen, probably There's No HOPI nearby. Lol, Larry! Yeah, it's like that. Clarkdale is a sleeper, hiding its goodies, Sue. OMG, I'm mentioned in a Good Luck Duck post! Can fame be far behind (or is it already here)? 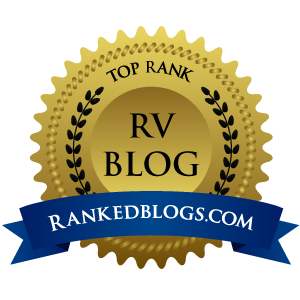 What a very nice blog about this area, thank you, Roxi. The patio at the Wild Rose is lovely, & the building has a very different purpose now from its original one. Did you know that it is the old jail building? Fame, infamy - it's all good, right? Yes, when I was here last year it was just "the old jail." Better now! You have pleased the feedly goddesses with your latest sacrifice and here you are again. Whatever you did, keep doing it. "Then a step to the riiiiiiiight""
Jan, I have to get all abject with that Goddess of the Feed. Nothing else will do. "Put your hands on your hips!" I loved the kitchen, do you thing I can go there and use it? I believe I went to the ruins a long time ago. Nice trip you had. I want the cup cake. You can't have that cupcake, since it has already undergone the miracle of transformation. Maybe another very similar? I went to that area a few months ago, amazing how I saw much more in this post than I saw when I was there. I'm taking my Mom up there on Tuesday, so I'll give it another go at really seeing it this time. Oh good, Shadow. Have fun! Nancy, I prefer the free myself. Don't worry - the 60's were just like Reefer Madness. Love Toozigoot, and that brilliant glass at the museum. Will have to check that out one of these days. When I get back to the States. Didn't know that about copper, very interesting. Unless you're pulling my leg, in which case LET GO! Sorry, it's getting late and I'm getting goofy. My hand on a roll of pennies, Pam - this is what the museum told me. Always something new/old in Clarkdale, Gaelyn. Oh we loved Tuzigoot! And I've lost track of how many times we've driven through Clarkdale. Love the whole area. How cute is that library? Copper is a natural fungicide. Many organic gardeners spray a copper solution on their tomatoes and grapes, for example, to prevent blight. I named one of my cats after Tuzigoot, but he would only come to Tootsie. I'm pretty lateto the party here but I LOVE this post and this plave through your eyes. Copper, great stuff. Grocery cart handles, great idea. If I can get out there will you be my tour guide? I love the places you go and your great pictures. Love this plaCe. What is a plave anyway?? It doesn't even matter what a plave is, Sherry - I love it, too. You bet I'll be your tour guide! Bring your shades - it's about to get sunny. That's so cute, Tuzigoot. :o) I like it, Chinle. I'm afraid I would have eventually shortened it to 'Goot. I didn't know that, Bill. Copper is amazing. They yarnbombed the heck outta that library, didn't they Brenda? Loved visiting Clarksdale via your words and eyes! That photo puts a whole new meaning on hug a tree. That tree likes it now, but will start to complain when Spring arrives, Contessa.